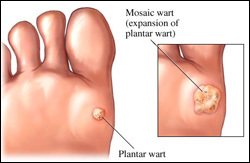 Without treatment, plantar warts can grow, spread and prompt new warts to grow as fast as the old ones disappear. If you can't confidently identify a growth on your foot, visit Treasure Coast Podiatry Center to ensure a correct diagnosis. Early diagnosis and treatment from our Stuart office can decrease the risk of the wart spreading and multiplying.